Choosing the best convection microwave oven is essential if you want to combine functions and save precious countertop space in the kitchen. Most families have two separate appliances when it comes to toaster and microwave ovens, but that’s not often the ideal solution if you have limited counter space in your kitchen. More and more people are turning to convection microwave ovens which combines the best of both worlds – they can heat up food quickly just like the good old microwaves, and at the same time double up as convection ovens for baking, broiling and toasting. The convection fan provides hot air circulation and cooks food 25% faster compared to an oven without the fan. Think of it this way – when cold air blows against you in a chilly winter day, you feel much colder compared to a windless day of the same temperature. The same principle applies to the microwave convection ovens, where hot air is blown throughout the oven to achieve faster and even cooking. Generally, a convection oven is more desirable than a regular toaster oven thanks to the extra fan and exhaust system. However, if you do not need the convection function, you can opt for a microwave toaster oven combo instead. If you need the functions of both a microwave oven and a convection toaster oven, we have some recommendations for you. Buying a hybrid system like the convection microwave oven doesn’t have to break your bank. More often than not, the cost of a good convection microwave oven is cheaper than buying two separate appliances. Of course, the main advantages come in the form of having an all-in-one cooking appliance and reduced clutter on your counter top. The Cuisinart CMW-200 Convection Microwave Oven is our top pick for a reason. It has a sturdy and clean stainless steel exterior, comes with a grill with 2 adjustable heights, a wealth of presets for both microwave and convection oven functions, as well as the ability to use combination settings for unlimited number of cooking options. It’s worth noting that the Cuisinart CMW-200 was the only microwave convection oven that we kept for personal use after all the tests were done. While it may seem to command a slightly higher premium than other standalone convection ovens and microwave ovens, keep in mind that this oven is meant to combine the functionalities of 2 machines into a single kitchen appliance. We still have our large convection oven, but we found ourselves using the Cuisinart CMW-200 far more often because it requires a much shorter pre-heat time and overall cooking time. The Cuisinart CMW-200 features a spacious 1.2 cubic-foot capacity and equipped with 1000 watt heating element. The heating element is one of the more powerful variant considering its relatively compact size, which measures at 21.2″ (L) x 19″ (W) x 12.2″ (H). The exterior and interior of this convection microwave oven are made of brushed stainless steel that gives it a premium look. The interior stainless steel surface absorbs no odors and is very easy to clean given its non-sticky nature. The turntable tray measures at 12″ and is removable from the convection microwave oven for easy cleaning. 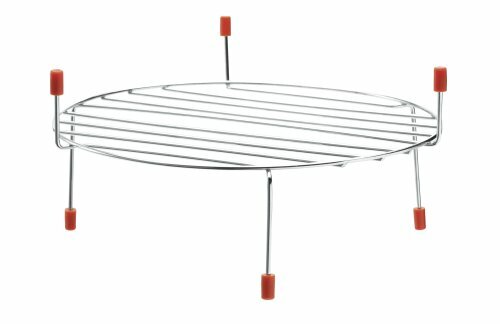 A reversible grill rack is provided as part of the standard purchase, which features 2 different heights depending on how you place it. The Cuisinart CMW-200 comes with 8 versatile functions, which include Microwave, Convection, Convection Roast, Convection Fast Bake, Grill/Combo, Keep Warm, Defrost, Memory. You can program up to 3 cooking procedures into memory, each with one or two stages of cooking. View page 18 of CMW-200 instruction and recipe booklet for details on programming a memory. If you are looking to make quick meals with the more common food items, the Cuisinart CMW-200 comes with 9 preset functions that cover Popcorn, Potato, Beverage, Reheat, Fresh Vegetable, Frozen Vegetable, Roast Chicken, Cake and Pizza. Each of them is customized by the nature of the food, for instance you can choose between 1 to 5 potatoes or the number of ounces for your beverages. Refer to the instruction manual for more details. 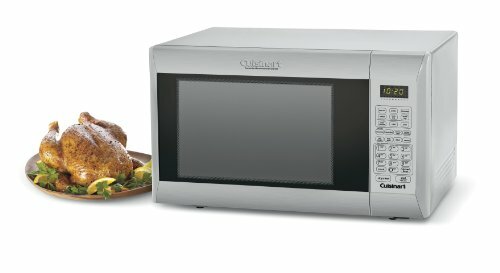 We found ourselves using the Cuisinart CMW-200 daily for its microwave function, and it has provided consistent and reliable results. Once in a while, we use the convection feature for cooking smaller food items because it preheats much quicker than a regular toaster oven. We do have a Breville BOV845BSS Smart Convection Oven which we love, but it’s just not as versatile as it doesn’t come with microwave functions. The Cuisinart CMW-200 Convection Microwave Oven is a true all-rounder when it comes to cooking and heating. It has received very high rating on Amazon for its reliable microwave function and quick convection cooking. The phenomenal performance can be partly attributed to its combination and multi-stage cooking functions. One of the biggest advantages that a convection microwave oven has over regular ovens is its ability to combine microwave and convection cooking into a single cooking session. Lets say you want to defrost a casserole, heat it up in the microwave and then grill it to melt the cheese and brown the top. You can set the microwave convection oven to defrost for 10 minutes, then bake with microwave at 100% power for 5 minutes, followed by grilling for 1 minute. We’ve saved this sequence into the programmable memory and now we can have perfectly grilled casseroles right from the freezer, anytime. If you are using it in convection mode, you can use any type of cookware (including metal bowls). But if you include microwave function in your multi-step cooking or use it simply as a microwave, do not use cookwares made of metal or clad with metallic paint. I prefer to use Pyrex 2-Quart Glass Bakeware Dish because it fits perfectly in Cuisinart CMW-200 and is compatible for both microwave and convection cooking. Cuisinart is well-known for their sturdy appliances and long 3 years limited warranty, beating its competition in the warranty game by two extra years. We don’t really have any gripe when it comes to the design, reliability and versatility of the Cuisinart CMW-200, but if we really need to find fault with the model, it has to be in the weight department. This isn’t really a fair comparison, as the convection microwave oven packs the electronics and heating elements for BOTH microwave and convection functions. Weighing in at 40.8 pounds, you can’t really move it around all the time. It’s meant to be a semi-permanent addition to your counter top. The Cuisinart CMV-200 is the best convection microwave oven out of the 10 models we have tested, and we have good reasons to select it as our top pick. It is affordable, highly versatile, saves countertop space, and combines both microwave and convection features flawlessly. If you are replacing either your microwave or toaster oven, we highly recommend that you get a hybrid – specifically the Cuisinart CMW-200 convection microwave oven. Samsung isn’t really a household name when it comes to kitchen appliances, but the Samsung MC12J8035CT Countertop Grill Microwave Oven is one of the best options available if you are in the market for a reliable microwave convection oven. It is constructed more like an oven than a microwave, as the front tainted glass door pulls down rather than open up to the side. It also features a minimalist exterior as the all-glass touch control are built into with the front glass – you won’t see any buttons or controls protruding from the panel. We can’t help but think that the design language was borrowed from Samsung Smart TVs, which gives it a more sophisticated look. If you value aesthetics or looking for a beautiful convection microwave oven that complement your minimalist kitchen, this model will fit right in. Measuring at 20.8″ (L) x 18.5″ (W) x 15.9″ (H), its has the same capacity with Cuisinart CMW-200 at 1.2 cubic feet. However, the Samsung MC12J8035CT is about 4″ taller than its Cuisinart counterpart, mainly due to the inclusion of a pull-down front door instead of a door that opens to the side. These are actually just fancy names for the convection system and dedicated grilling heating elements at the top of the interior space. They function just as well as the Cuisinart CMW-200, but it’s worth noting that the PowerGrill Duo heating elements delivers a maximum power of 1600W, making it more powerful when it comes to browning and grilling food quickly. The Samsung MC12J8035CT is highly versatile and comes with 10 cooking functions, including Microwave, Convection, Power Convection, Auto Power Convection, Combination Cooking (microwave and convection), Auto Cook, Grill, Slim Fry, Warm Food and Defrost. 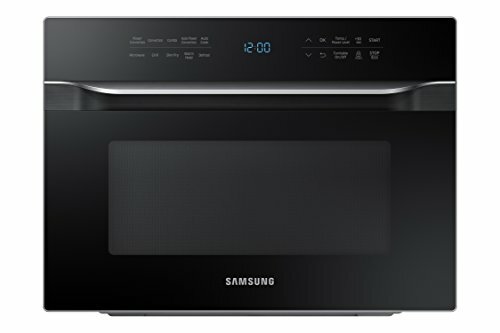 Instead of a glass tray, this Samsung countertop convection microwave oven comes with a ceramic plate to better distribute heat within the plate. You can place food directly inside the ceramic plate for cooking, eliminating the need for separate cookwares. The interior is scratch-resistant and very easy to clean. The ceramic enamel gives it a polished surface that’s non-sticky and easy to maintain, making removal of grease or oil an effortless task. A simple wipe can usually clean the interior sufficiently. The Samsung MC12J8035CT isn’t just a looker – it is packed full of features, just like the Cuisinart CMW-200 above. In fact, it comes with extra modes such as Slim Fry and Eco Mode that are not available in the Cuisinart CMW-200 (details below). Think of this as air-frying your food inside a microwave convection oven. We’ve used the slim fry function to prepare fried potato wedges for a couple of times and they tasted exactly the same as the normal, deep fried wedges. Of course, the slim fried version is much healthier as they come with reduced fat. If you want to replace your air fryer along with your ovens, this Samsung oven can be a microwave-convection-air fryer combination. Even at rest, conventional counter top microwave use power to maintain essential functions. The Eco Mode button conserves power by turning off the display when not in use and is more convenient than unplugging the microwave entirely. The Ice-Blue LED display located on top of the front door is easily legible and bright enough even in a fully-lit room. If you want to mount your Samsung oven into the cabinet space for a seamless integration, you can purchase the Samsung 30″ Stainless Steel Trim Kit. It features a brushed steel finish to give it a premium look. It can be pretty confusing with all the bell whistles that come with Samsung MC12J8035CT, so you should definitely read the full user manual before start using it. However, as advanced as it is, we found the oven lacking in the most unimaginable department – the stop timer. Samsung has opted to go for minimal touch control design that radically reduces the clutter on the front panel. However, this also means that the model is devoid of the usual number pad that comes with regular microwave and convection ovens. You only have a 30 SEC button to press, so you have to press it multiple times to set up the time you need. Undoubtedly, the Samsung MC12J8035CT is designed to replace some of the major kitchen appliances in your house – the microwave oven, the convection oven, and even the air fryer. It excels in all these tasks and produces consistent results based on our extensive testing. However, it also commands a much higher price point than the Cuisinart CMW-200 reviewed above, which is packed with similar functions (except for Slim Fry and Eco Mode). If you have some cash to spare, go for this Samsung MC12J8035CT. Otherwise, the Cuisinart CMW-200 will give you the best bang for your bucks. If you fancy a smaller microwave convection oven, the Sharp R830BK may be right up your alley. Comparing side-by-side, the Sharp model has a slightly smaller footprint than all the other models listed in this article. However, this also means that it has the smallest internal capacity, sitting at 0.9 cubic feet compared to 1.2 cubic feet of both Cuisinart and Samsung models reviewed above. It also comes with a lower microwave power rating at 900W (vs the 1000W featured in the other models), but it is surprisingly efficient when it comes to microwaving food, even more so than the other models in this list. This can be partly attributed to its smaller internal capacity. 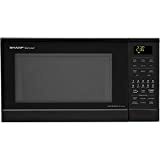 With that said, with Sharp R830BK you will definitely not lose out on any essential features that come with the other microwave convection models in the market. Measuring at 20.5″ (L) x 19.1″ (W) x 12.4″ (H), the Sharp R830BK is only slightly smaller than the Cuisinart model despite sporting a lower internal capacity. 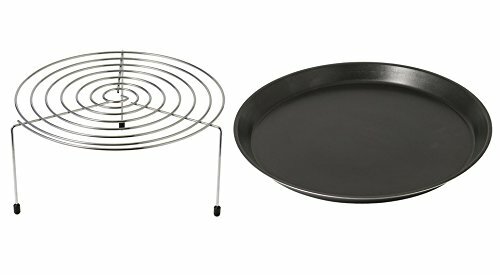 However, the carousel turntable in the oven is surprisingly large, measuring at 12.75″ compared to the 12.4″ ceramic plate of Samsung MC12J8035CT and 12″ glass turntable of Cuisinart CMW-200. It is also lighter than the Samsung model reviewed above, weighing in at 42 pounds (about the same weight as Cuisinart CMW-200). The Sharp R830BK doesn’t sport a brushed stainless steel finish like most other convection microwave ovens, instead it is clad with a glossy black finish along with scratch-resistant glass door for a shiny outlook. Instead of opting for a single top heating element like most other ovens, the Sharp R830BK sports 2 heating elements located at the top and bottom of the interior. Coupled with a powerful fan and exhaust system, this oven provides fast and consistent results when it comes to baking, browning and roasting in convection mode. The powerful dual heating elements rated at 1600W provide fast preheating and a wide temperature range in convection cooking mode (100oF – 450oF), making it very versatile when it comes to convection cooking. The Sharp R830BK comes with multiple preset buttons for convection cooking, which includes Auto Convection, Auto Cook, Auto Roast, Auto Defrost and Combination Cooking with Microwave. One-touch buttons are also available for microwaving common food items, including Dinner Plate, Popcorn, Frozen Entrée, Potato, Fresh and Frozen Vegetables). It also comes with a +30 SECs instant start button to quickly microwave food that only requires 30 seconds. The Sharp R830BK excels at fine little details that make the user experience more complete and fuss-free. While it may come at a smaller capacity, one thing that it doesn’t disappoint is the user-friendliness it provides. It even comes with a detailed user manual to help customers maximize its potential. While most other models only activate the interior oven light when they are running, the Sharp R830BK thoughtfully activates its interior light when the door is opened to offer better visibility. It helps tremendously when we were wiping the interior clean. Sometimes you may want to have a midnight snack and prefer not to make excessive noise, this Sharp model allows you to switch off the sound alert when necessary. 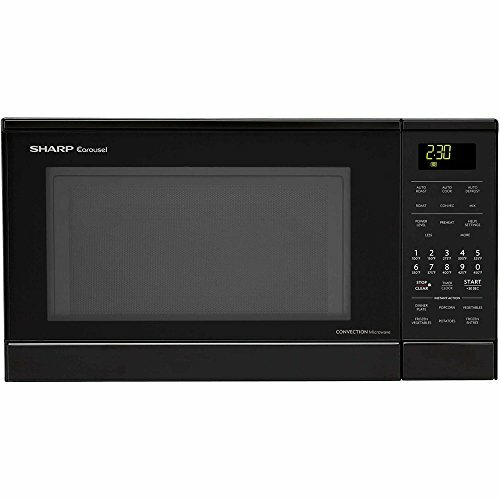 The Sharp R830BK features 4 different combinations of microwave and convection cooking (from mostly microwave to convection, to mostly convection to microwave). Magnatron tube is the most important part in a microwave convection oven. It is the high-powered vacuum tube that generates microwave that heats up food, and it is also the most expensive to replace. Sharp offers 5 years parts warranty for the magnatron tube in R830BK oven to give consumers extra confidence. Other than that, Sharp offers 1 year parts and labor warranty for the rest of the machine. Of course, no product is perfect, and so is the Sharp R830BK. While it gets most of the things right, it is definitely not the cheapest convection microwave oven out there. Costing almost double the asking price of Cuisinart CMW-200, this Sharp model does not really give you the best price to performance ratio. All the functions found in Sharp R830BK can be found in the Cuisinart model, and the CMW-200 comes with a higher capacity at 1.2 cubic feet with a similar exterior size and weight. While the Sharp R830BK is a reliable and good performing convection microwave oven, we think that the premium price point cannot be justified when there is obviously an equally well designed model (the Cuisinart CMW-200) going at almost half the price. Unless you are highly attracted by the aesthetics of Sharp R830BK or simply have extra cash to spare, we strongly recommend that you buy the Cuisinart CMW-200 instead of this Sharp model. There you have it, these are the best convection microwave ovens that we have selected out of 10 different models that we have tested. We hope you found the article useful. Be sure to check out our top picks for toaster ovens that give you the best bang for your bucks. Below are a few models that you should AVOID at all costs because they either pose fire hazard, have a high malfunction rate or simply irreparable.